YOU KNOW THE story. Despite technologies, regulations, and policies to make humanity less of a strain on the earth, people just won’t stop reproducing. By 2050 there will be 9 billion carbon-burning, plastic-polluting, calorie-consuming people on the planet. By 2100, that number will balloon to 11 billion, pushing society into a Soylent Green scenario. Such dire population predictions aren’t the stuff of sci-fi; those numbers come from one of the most trusted world authorities, the United Nations. But what if they’re wrong? Not like, off by a rounding error, but like totally, completely goofed? But Empty Planet is not a book about statistics so much as it is about what’s driving the choices people are making during the fastest period of change in human history. Ibbitson and Bricker take their readers inside the Indian slums of Delhi and the operating rooms of Sao Paulo, Brazil, to eavesdrop on the conversations young professionals have at dinner parties in Brussels and over drinks at a young professionals’ club in Nairobi. The end result is a compelling challenge to long-entrenched demography dogma, Trojan Horse-d inside an accessible, vivid portrait of modern families from every walk of life. The authors sat for an interview about how they arrived at a radical new outlook on the human race and its implications for future societies. WIRED: The UN is a well-regarded authority on everything from public health to food security and global economics. What made you think that they were getting population growth wrong? JI: The UN population data is something we call vertical knowledge, or “everybody knows” knowledge. 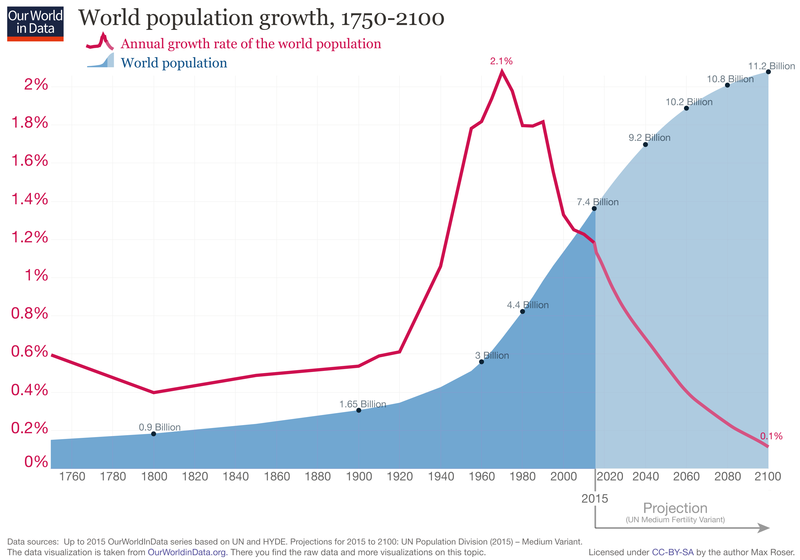 Whether it’s the prime minister of a country, a university academic, a business leader, a student, just a guy on the street, you ask any of them, “What is happening with population?” and they go, “Oh it’s terrible, there’s a huge population explosion. I was just watching a movie last night where Earth got so crowded everyone had to relocate to the moons of Jupiter.” It’s just deeply embedded. DB: And whenever that happens you should really go and look hard at the assumptions, and test them yourself, because most of the time reality has already moved past where that vertical knowledge resides. JI: So that’s what we did. And it didn’t take long before we realized that there was a whole body of demographers who have been questioning the UN’s numbers for years. They’ve just been talking to each other at conferences and through scholarly articles, but they’ve never gotten this information before the general public. That was kind of our starting point. And then when we went out and talked to real people in the world about the choices they’re making, that’s when the statistics we were seeing came to life. You traveled all over the globe to interview people for this book. What’s one image or conversation that really made the statistics jump off the page? DB: There was a moment when we were sitting in this little school in Sriniwaspuri, listening to a focus group of 13 or 14 women who lived there. And I kept seeing this faint glow light up under their saris. I didn’t know what it was. And then I saw one woman reach in and pull out a smartphone, look at it, and put it back. And I realized, here we are in a slum in Delhi, and all these women have smartphones. Who can read. Who have data packages. And I was thinking, they have all of human knowledge in their hands now. What’s the impact of that going to be? DB: So, the UN forecasting model inputs three things: fertility rates, migration rates, and death rates. It doesn’t take into account the expansion of education for females or the speed of urbanization (which are in some ways linked). The UN says they’re already baked into the numbers. But when I went and interviewed [the demographer] Wolfgang Lutz in Vienna, which was one of the first things we did, he walked me through his projections, and I walked out of the room gobsmacked. All he was doing was adding one new variable to the forecast: the level of improvement in female education. And he comes up with a much lower number for global population in 2100, somewhere between 8 billion and 9 billion. JI: Lutz has this saying that the most important reproductive organ for human beings is your mind. That if you change how someone thinks about reproduction, you change everything. Based on his analysis, the single biggest effect on fertility is the education of women. The UN has a grim view of Africa. It doesn’t predict much change in terms of fertility over the first quarter of the century. But large parts of African are urbanizing at two times the rate of the global average. If you go to Kenya today, women have the same elementary education levels as men. As many girls as boys are sitting for graduation exams. So we’re not prepared to predict that Africa will stagnate in rural poverty for the rest of the century. DB: And that’s just one cultural variable. So you can say that the old models always worked in the past, but what if the past is not prologue? What if we’re moving into a different cultural moment? What if it’s accelerating? And what if that cultural moment really is about the personal decisions women make about their lives? JI: We polled 26 countries asking women how many kids they want, and no matter where you go the answer tends to be around two. The external forces that used to dictate people having bigger families are disappearing everywhere. And that’s happening fastest in developing countries. In the Philippines, for example, fertility rates dropped from 3.7 percent to 2.7 percent from 2003 to 2018. That’s a whole kid in 15 years. In the US, that change happened much more slowly, from about 1800 to the end of the Baby Boom. So that’s the scenario we’re asking people to contemplate. WIRED: OK, but so what though? Why does it matter who’s right or wrong? DB: A lot of people who are thinking about the future of the world, the future economy, the future of city planning, they’re basing their projections on that future size of the human population. And people are actually making decisions based on this. If you dig in and see that there isn’t going to be a lot of growth of young people coming into the population, a lot of growth is actually going to come from older people hanging around longer because we’re getting better every day at keeping them alive. How does that affect transit decisions in New York City? Or how governments support rural communities that are collapsing at an enormous rate right now. All those decisions are based on having a correct understanding of what our societies will look like in the future.